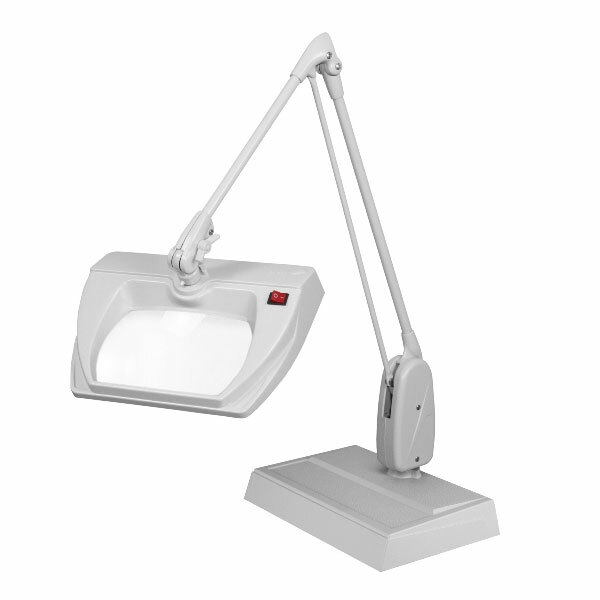 Dazor's Stretchview 33-Inch ESD Safe Desk Base Magnifier is the perfect multipurpose Dazor Magnifying Lamp and low vision enhancement tool. The rectangular shaped magnifying lens "stretches" the traditional 5-inch circular viewing area to 6.75 inches while the wider viewing area allows for comfortable vision with both eyes and also reduces eyestrain and fatigue. Visual scanning speed is increased because more surface area is magnified. This 3-diopter Dazor Stretchview Magnifier (1.75X) is ESD Safe and features exact positioning of the light source behind the lens allowing for a choice between even, shadow free illumination, or a hi-lighting effect to emphasize contrasts on irregular surfaces. Other features of the Dazor Stretchview Magnifier include a clear crown-optical glass lens for clear and distortion-free viewing, Dazor's patented 33" contemporary-style floating arm for smooth and easy positioning of the lamp to any position, a sturdy weighted desk base with durable powder-coat finish. The Dazor Stretchview Magnifier is also UL, cUL, and CE certified and includes a 5-year warranty.